Tonight I decided to try making Greek potatoes on the Traeger pelllet grill. 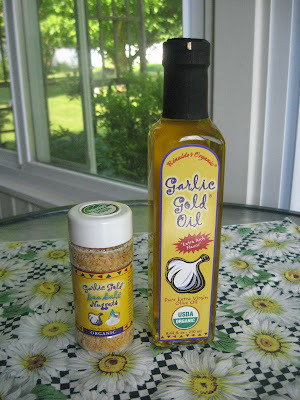 Kathy had sent me another bottle of Garlic Gold Olive Oil, and I still had some of the Garlic Nuggets Original. 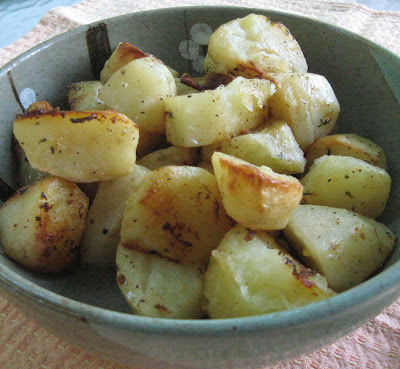 When I got the package, I started thinking about the Greek potatoes that I so loved when I lived in Greece. 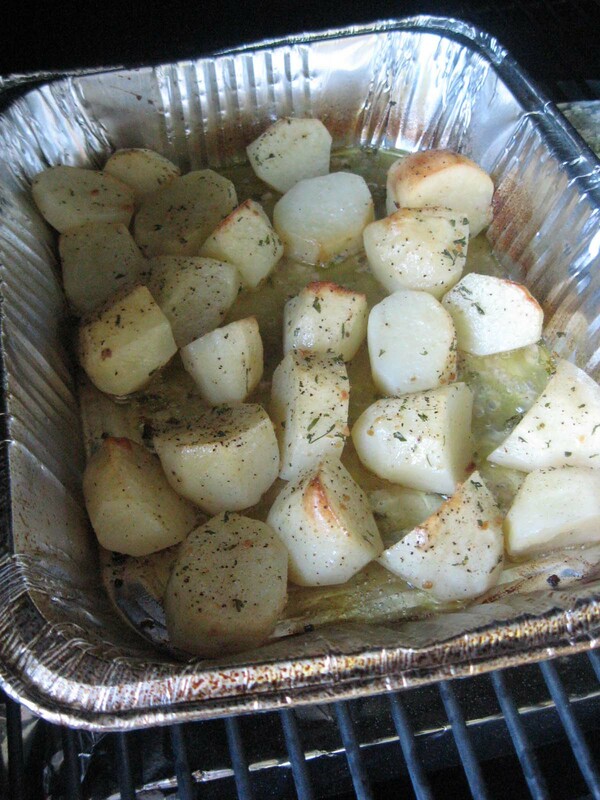 Generally, I do Greek potatoes in the oven but usually not in the summer when it's hot due to the cooking time. Hitting the grill with the potatoes made sense, and Traeger is a convection (or lid down) outdoor cooker. If you do not have a pellet grill, you can do the same here with the lid down on a gas grill or kettle type charcoal grill or by putting aluminum foil on top of the pan on an open charcoal grill. The only key really is to contain the heat so that the potatoes cook through. First, I peeled six potatoes. The amount can vary. You just want a single layer. I could have put in more, but we only had three eating tonight. I shook up the potatoes so that they were well coated and then put them in a throwaway aluminum pan. The pan size is probably about 9 x 12. After I put the potatoes in the throwaway pan, I added a little fresh ground pepper, parsley, and some Garlic Gold Nugggets. We all like garlic, so I added those for more garlic flavor. With just the oil, people know the food tastes great, but they can't usually place the natural garlic added to the oil. So, you can serve the Garlic Gold Oil and never even blip the radar of those who think they do not like garlic. 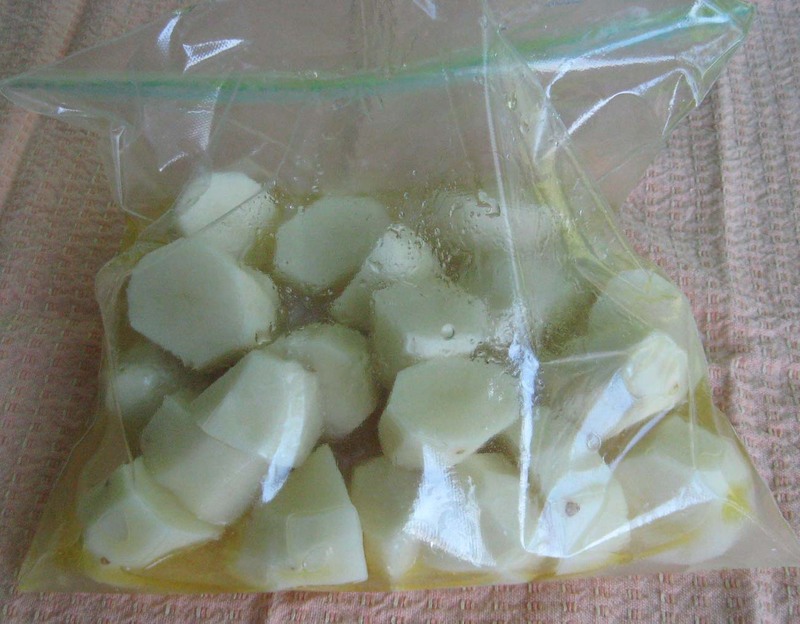 But, you can zip things up with the Garlic Gold Nuggets both before or after cooking. I grill smoked the Greek potatoes on high on the Traeger for an hour. 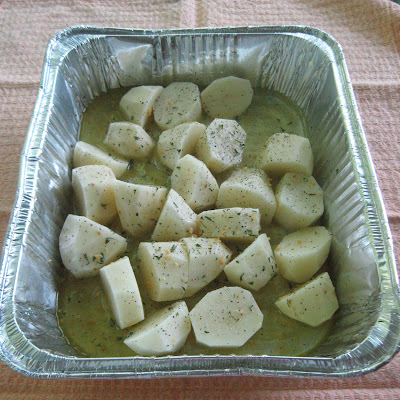 That was just right for the almost all of the water and oil to absorb and for the grilled potatoes to be browned. That is what you look for, and I'd say the times (depending on the grill or smoker) could run from 45 minutes up to an hour and 45 minutes. You can check by sticking a fork in one of the potatoes. It should be nice and soft. The guys were seriously impressed with the Garlic Gold Greek Grilled Potatoes and said to put the recipe on the keeper list. I would have to agree even if I did make them. They taste like authentic Greek potatoes but with a hint of smoke. Yum. Talking about some good stuff. I get Garlic Gold online. Both the natural Olive Oil infused with a hint of garlic and the nuggets which shake on like a seasoning for cooking or at the table are fabulous. What a great way to make potatoes, I will give that a shot, if I can find an equivilent of the Garlic Gold Olive Oil up here in Canada. The bottle looks familar so I may be able to find it. I got to give this a try for sure! Very simple to follow recipe! Thanks, I bookmarked your site. I'm making these gems tonight to accompany a giant 4 lb slow smoked Greek lamb burger. Thanks for the great recipe! You can use any olive oil or I'd guess even a vegetable oil on the grilled potatoes. Then add garlic or other seasonings. I just especially love Garlic Gold. It's my favorite olive oil, and the garlic is natural and so smooth that you'd maybe not even guess it was garlic.